Of course that is not its real name. The shawl is called Carol’s Frequency. 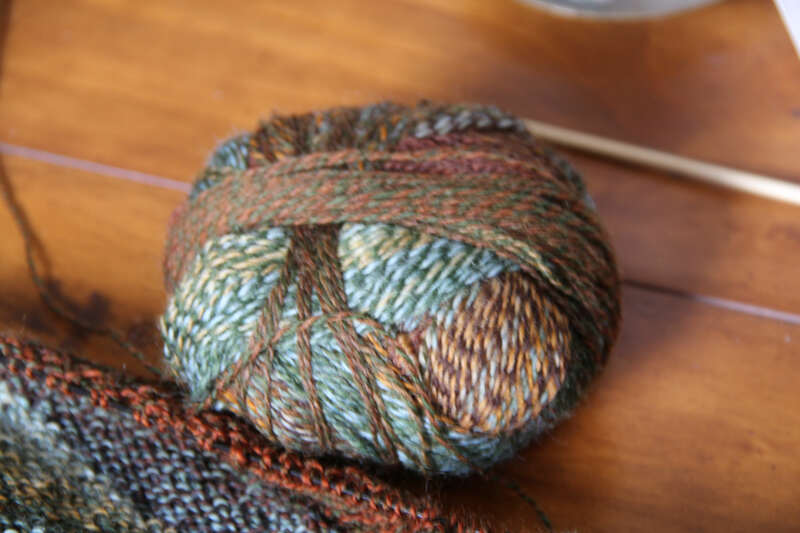 When I first saw the pattern I could imagine it in autumnal colors that were a touch rustic. I found the yarn to suit that vision in Schoppel Woole Zauberball Crazy. I don’t remember the name of the colorway. 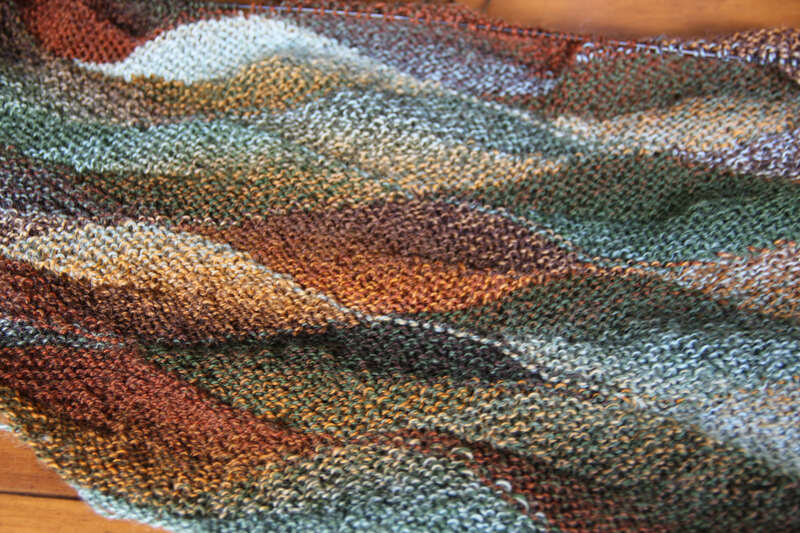 The shawl is worked entirely in short rows, wave by wave. While the pattern promo says there is no wrapping, what the designer has done instead is create a one stitch float which you pick up and with the stitch it floats across you knit both through the back loop. Most of the time this closes up the holes created by short-row work. However, at least once or twice in a row of waves a large hole appears which is due to the short-row work. I have this thing about holes. I hate them existing where they shouldn’t and would knit hanging upside down from a chandelier even though I am afraid of heights if it meant getting rid of them. I had to address this hole problem. What I did was pick up the float and then go into the small cross bar of the stitch in the row below and pull that up. Then I knit the float and the stitch, and cross bar together through the back loops. It closed up the holes nicely. So this is what I am currently working on. I still have a bit of a way to go before I can start the bind off and while this has been a frustrating knit at time, I do really like the way it is starting to look. leave it to you to figure it out! 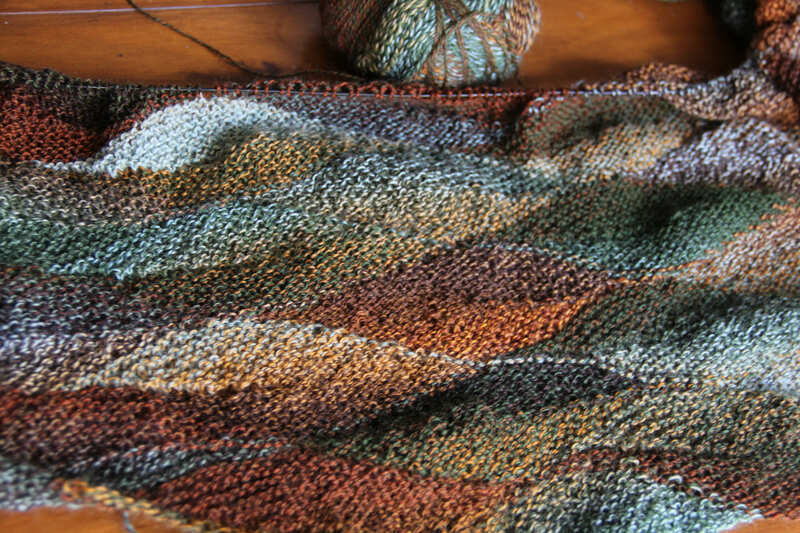 I think that is going to be gorgeous when you finish – what a great yarn for the pattern! It looks like they were made for each other. Wish I could see you knitting hanging upside down from the chandelier, though. A picture! I’m with Salpal – what I’d give to see that!! You are clever to work out how to do that and then to remember how and when to do it every row! It is looking so pretty! You should be very pleased with the results. It’s gorgeous! I think I used the same color for this zigzag striped beret, alternated with a solid green. I wrote the colorway was “green brown” (which is neither exciting nor very descriptive. Hope that helps! Yes, it does look like the same colorway. Thanks!